Posted on June 21, 2017 , in Stationary Bike. Cardiovascular exercise is one of the best ways to burn belly fat while increasing your lean muscle mass. 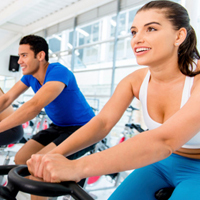 Using a stationary bike is among the top ways to get rid of belly fat. Below you’ll learn what you should focus on during your workout to help you lose the bulge. If you can’t do 30 minutes at this level at the beginning, don’t worry. Even doing a few 10-minute sessions with breaks will help you burn calories and lose belly fat. Once you’ve worked up to a moderate workout schedule, try putting more effort into half of your weekly workouts. Try increasing your resistance to a higher level and cycle for 20 to 30 minutes at an intensity that increases your heart rate to 75 to 85% of your maximum rate. Studies have shown that incorporating these high-intensity workouts into your routine can increase the amount of belly fat you lose compared to more moderate workouts. You’ll want to avoid doing high-intensity intervals during every workout because it can cause you to burn out and make your additional workouts less effective. Start by warming up at low resistance for 5 minutes. Then pedal at a higher resistance and more intense pedal stroke for 1 to 2 minutes. Next, take a break, pedaling easily for 1 to 2 minutes while your heart rate recovers. Complete this high and low intensity cycle 10 to 15 times. You can also do shorter intervals (ie: 30 seconds) if 1 to 2 minutes is too long. Even in such a short workout, you’ll receive the benefits of burning extra belly fat. These stationary bike tips will help you burn belly fat so you can look incredible this summer. To find out more about our other great deals on exercise equipment, download our monthly promotion and save.